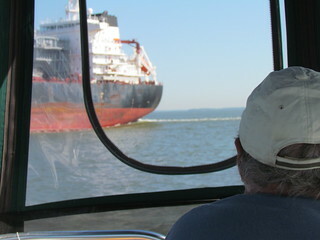 Rock Hall anchorage, C and D Canal to Delaware then New Jersey! 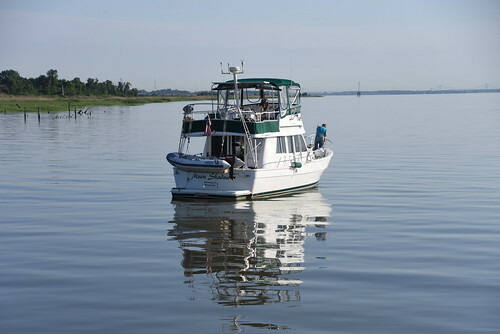 Every boat doing the loop may travel slightly different paths at slightly different speeds. Leaving Annapolis we have teamed up with boats that we met last September in Chicago and may not have seen since we landed in Florida! 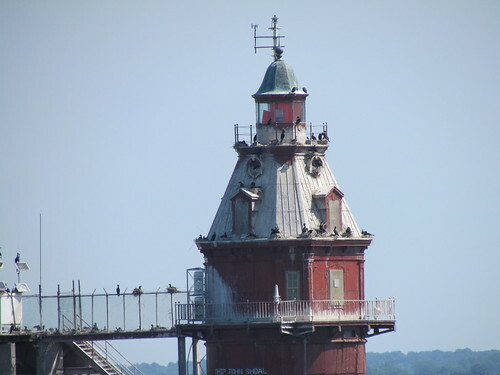 As we left Annapolis Landing on May 31, some boats stopped at the fuel dock or pump out station and then we all headed East to spend a few nights at anchor. Two places kept popping up as destinations to “not miss” on the Chesapeake- Rock Hall and St Michael. We chose Rock Hall. We found a nice little bay on Swan Creek to drop anchor and took the dinghy to a marina. 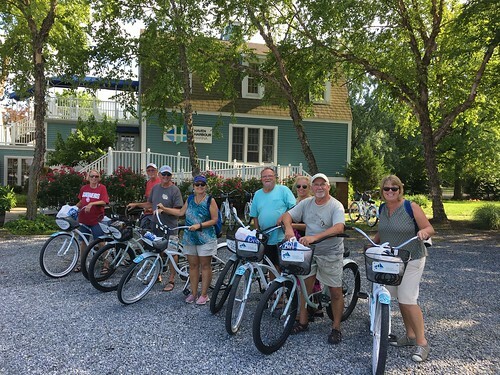 The dock master at haven Harbor Marina was happy to let us tie our dinghys to her dock; and even offered us use of the marina’s free courtesy bikes! Dave took good shots of a boat that wasn’t in our group. He took the dinghy over to introduce himself and get an email so we can send them photos of the boat at the end of the rainbow! 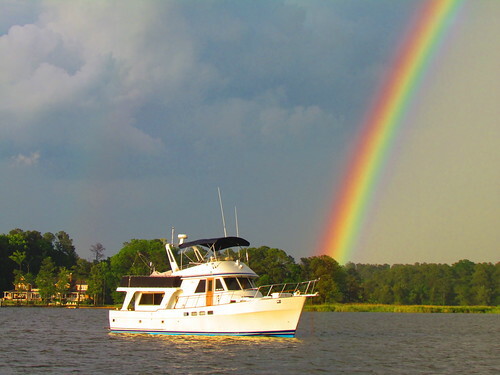 A quick storm blew through, and we were rewarded with a beautiful rainbow at the end of the day. Next up in our journey, is the C and D Canal. 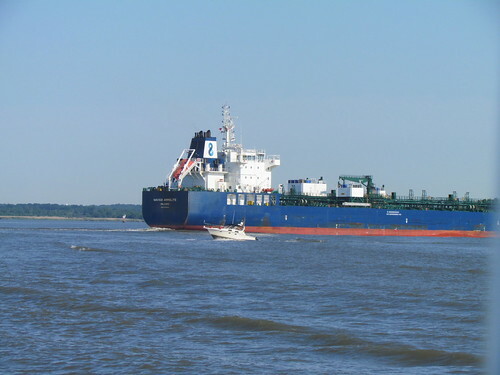 The “Chesapeake and Delaware” canal provides a short cut to the ocean between these two bodies of water. It is known for being narrow in spots, turbulent in areas, and shallow if outside the channel. Our intent was to hit the entrance on flood tide so the current would give us a push through the canal. Worked nicely, at times we were cruising at 11 mph. ( our average is 8.5) . 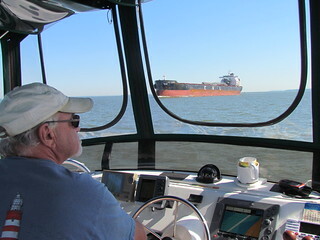 By late afternoon, we headed into Delaware Bay and our anchorage behind Reedy Island. 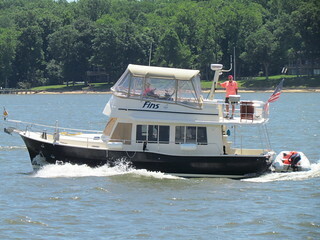 our friends on Fins passed us near the canal and headed for a marina in Delaware City. We are now in another potentially challenging body of water. Often the winds come up in the middle of the day blowing waves from the ocean westerly up the channel. Hope our homework on the weather window pays off. The run down the bay from Reedy Island is timed for the outgoing tide- again planning to ride the extra 2.5 mph current to cruise the 55 miles in a timely manner. We plot our course just outside the main shipping channel to give the big boys all the room they need. Here we are looking back at Southern Cross and you can also see Enterprise scooting past the ship! 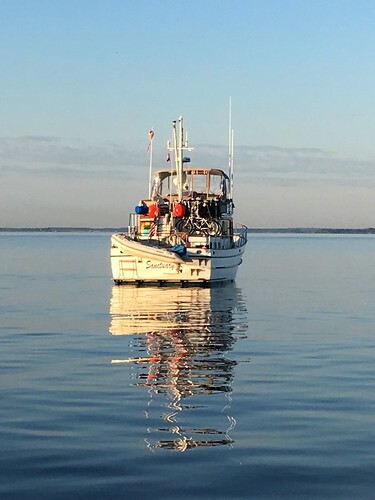 There is plenty of water depth, just slight maneuvering around any fish net stakes, ship wrecks or odd obstacles, including large light house channel markers. 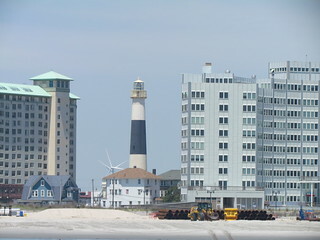 A short cut across Cape May cuts inland to the city of Cape May. 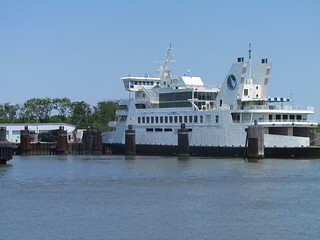 At the mouth of the canal is a terminal for large Ferry boats. Once we pass them, the channel is straightforward. Or so we thought. 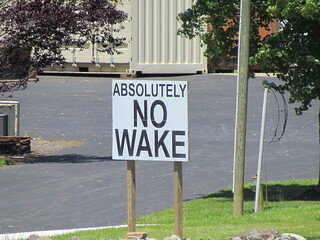 The rumor of New Jersey having the most aggressive boaters is now proving true. As we slowly work our way into the channel local fishing boats and power boats are continually speeding past us in very narrow conditions. Each wave of wakes causes us to heave side to side – we turn into the wakes but then all the boats seem to be topsy turvy. At one point we approached a narrow bridge with turbulent currents making steering a challenge. A quick look back, and here comes a large cruiser trying to pass us! Is this going to be the new normal! Apparently, New Jersey is the highest concentration of population per square mile, and also the highest concentration of boaters. Where is the Minnesota Nice when you need it? Without further venting, we arrive at our destination- Canyon Marina. Happy to get a looper discount and the AGLCA bonus of free electric hook up! The pool looks inviting, yet we pile into the courtesy van to head downtown for look at the shops, and a peak at the beach. First came across another group of boaters down town and took this group shot. We visited with Seaquest as we had two things in common- we both have a Mainship boat, and are both from Minnesota! (they are south west Minnesota near Worthington, and we are in Buffalo near Minneapolis) Small world. With an eye on the weather, we opt to stay an extra day to relax and regroup. The next few days will be on the open ocean. 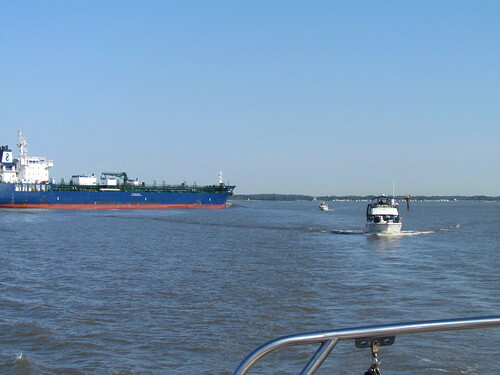 The option of following the New Jersey Intercostal water way has mixed reviews. At places it is very shallow and many spots have shoaled in to where the channel markers can’t be trusted to be in the correct place. Our choice is to find a good calm weather window and go the “outside route” up the Atlantic coast line- staying within a mile or so of shore. 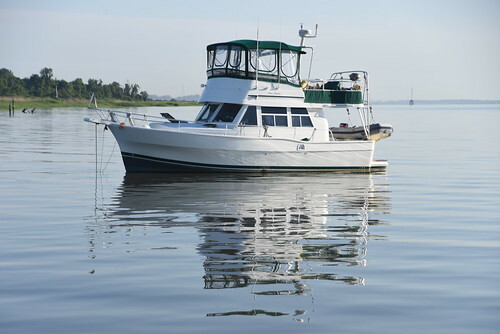 There are three inlets considered A class to come back in for the night. The first one is at Atlantic City so that is our destination. We are not traveling with Enterprise, Southern Cross, The Lower Place, and Sanctuary. Also touched base with Aquafennatic for a pot luck on the dock; Last Call is anchored is in the bay, and our friends on Fins went ahead. It was such a calm night in the marina, hard to believe rough weather is coming. With visions of staying at the Luxurious Golden Nugget Casino, reality set in, and we turned right instead. Anchoring in a bay across from the city (free). With the dinghy in the water, it was a quick ride across the channel to the boardwalk. 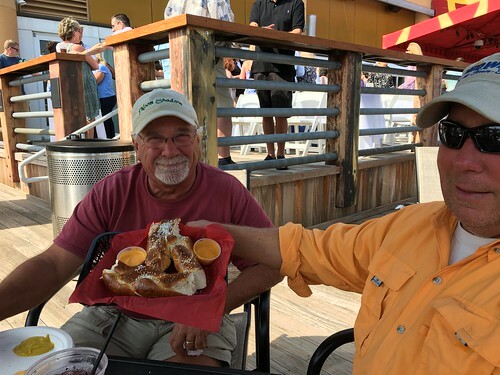 What a fun afternoon listening to the band play on the patio, snacking on humongous pretzels and enjoying a sunny day on shore. 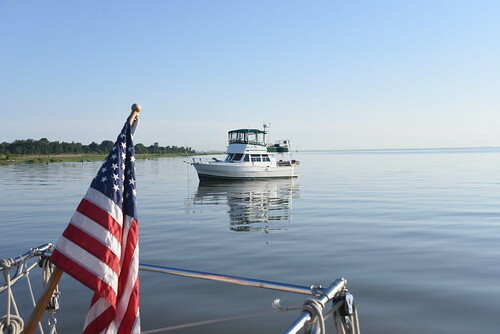 With the weather predicting high winds for 4 days; our group decided to bypass two inlets and head for Sandy Hook. This would add several hours to the days run, with the advantage of putting the open Atlantic Ocean behind us. The other option was to stay put in Atlantic City, and expect to stay put for up to 4 days waiting on calm weather. Off we go- we signed up to be at Rockafeller Plaza on Thursday morning; no way are staying put in Atlantic city for the week!! Visibility is about half a mile due to incoming fog banks. The wind is from the east blowing on our beam making for more rolling motion than we like. (honestly- a lot more motion than any of the girls like) A planned 55 mile run to Manasquan Inlet, grew into a 91.6 mile day as we rounded the tip of Sandy Hook. 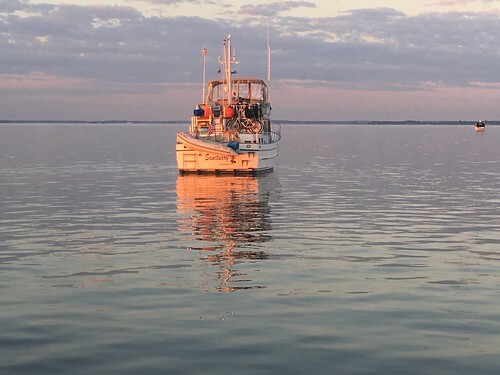 Good news, the anchorage is just around the tip near the Coast Guard station, so just as the sun is setting we drop anchor! Dave promised we would arrive before dark, and we did with about 10 minutes to spare. Wahoo… We can see a bit of the New York Skyline off in the distance. This coming week promises to be a highlight of our trip. We have logged 5316 miles. Our engines have 679 logged hours. We have been on the boat almost a year. Its a whirlwind, as we just passed through 3 states in 3 days and will be in New York tomorrow! Good Bye Maryland, Hello/ goodbye Delaware!! 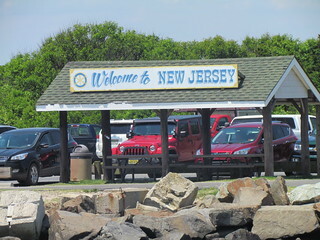 Welcome to New Jersey! 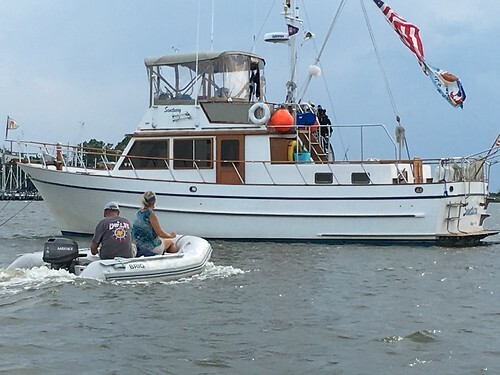 This entry was posted in America's Great Loop Adventure, Atlantic ICW, Moon Shadow Log and tagged aglca, Atlantic Outside Route, Chesapeake Bay Boating, loopers, New Jersey Boating, Rock Hall MD, Swans Creek. Bookmark the permalink.